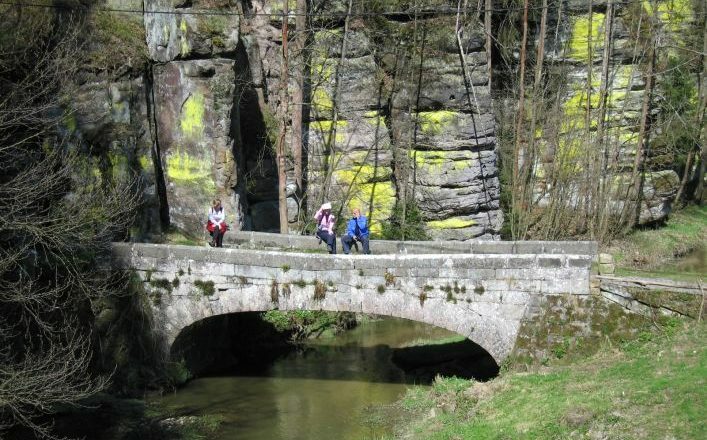 Bohemia is an unspoilt and highly picturesque region situated 50 miles/90 km north of Prague. This Village to Village self-guided walking holiday will take you through intriguing rock ‘labyrinths’, with marvellous view-points, and past evocative castles. 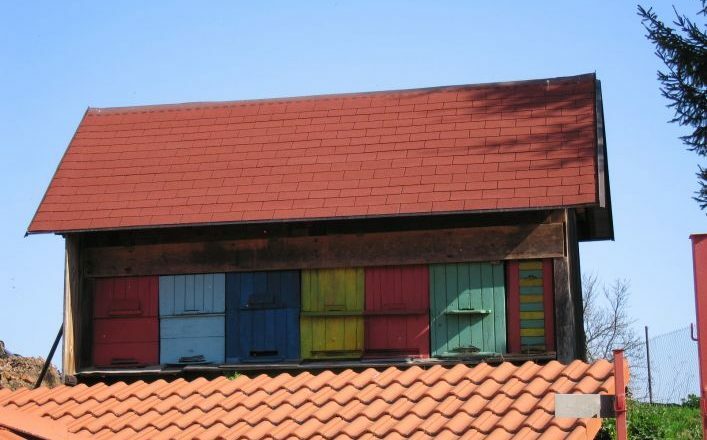 Bohemia is an unspoilt and highly picturesque region situated 50 miles/90 km north of Prague. This Village to Village self-guided walking holiday will take you through intriguing rock ‘labyrinths’, with marvellous view-points, and past evocative castles.The length of the walks is between 15 and 24 km, along well-marked paths. At the end of each day, comfortable hotels and satisfying food. Accommodation in Prague also available on request. £495 per person based on two people sharing. Accommodation in hotel*** situated near the centre of town characterised by the three-storey late-Gothic Valdická gate, its Baroque château and its arcaded houses. Zebín, a protected natural reserve with rare vegetation, is characterised by a distinctive basalt conical peak (399 m) above the village of Sedlicky, surmounted by a chapel of St. Mary Magdalene from around 1700 with a painting of the saint on top. The climb is strenuous but from the chapel there is a splendid panoramic view, including the whole of the Jicín basin, the Bradlec, Kumburk, Mlázovickýchlum, Tábor, Kozákov, Veliš hills and the city of Jicín. Prachov Rocks is an area of labyrinthine rock formations with a network of marked paths leading through them.Hotel *** in Prachov, located in a romantic part of Prachovskéskály (the Prachov Rocks). Jicín – Zebín 3 km – Kbelnice 3 km – Prachov 4 km. The Prachov Rocks – circuit 2 – 4 km. 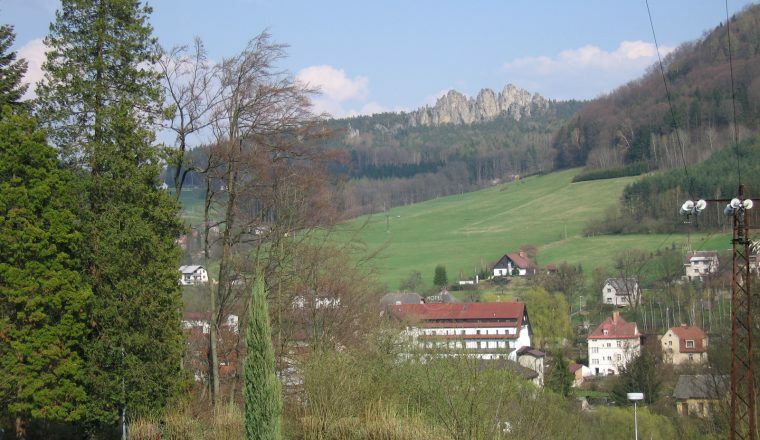 The Prachov Rocks – Prachov, hotel 2 km. Gentle terrain with beautiful views. Gentle walking with beautiful views. 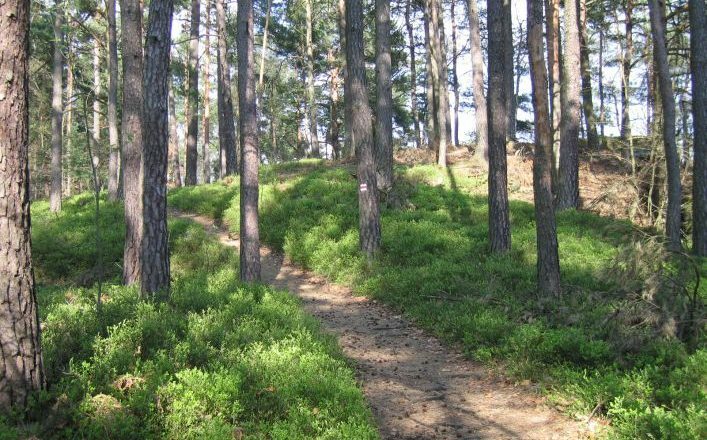 The romantic Klenice valley is flanked by sandstone rocks and pine forests between Kost castle and Strehom. Kost, built in the turn of the 14th and 15th centuries on a sandstone rock in the middle of three valleys, is the best preserved Gothic castle in Bohemia. Podtrosecká Údolí is a system of ponds which today forms a space of extraordinary scenic and natural value. The unique canyon valley is bordered by sandstone cliffs and these also often form the shores of the ponds. At Hrubá Skála, built on a monumentally high cliff, stands the Hrubá Skála château. Overnight in hotel*** in Hrubá Skála. The hotel is situated in a former château standing on the rocks with an unique view. Neprivec – Plakánek 3.5km – Kost 2km – Nebákov 8km – Trosky 3.5km – Vidlák 2.5km – Hrubá Skála 5km. Shorter route: Neprívec – Libošovice 1km – Nebákov 5.5km – Trosky 3.5km – Vidlák 7.5. 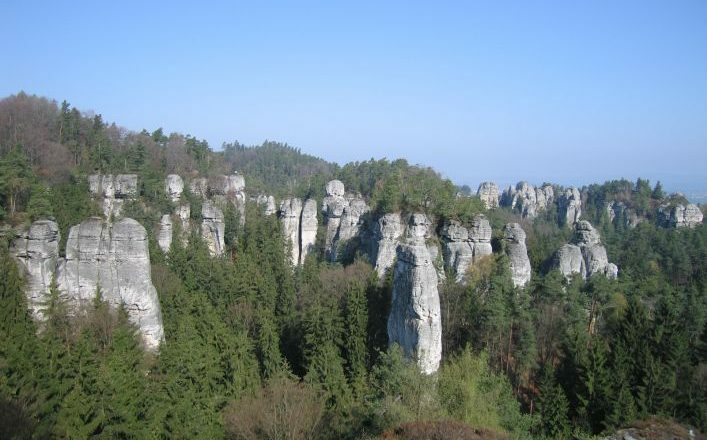 The Hruboskalské rock town consists of about 400 sandstone towers, some of which are are sixty metres/almost two hundred feet high. The rest of the walk is a mixture of fantastic rocky outcrops and ancient castles. There is Valdštejn castle; in Dolánky, one of the most beautiful and most typical gems of half-timbered architecture in the region. 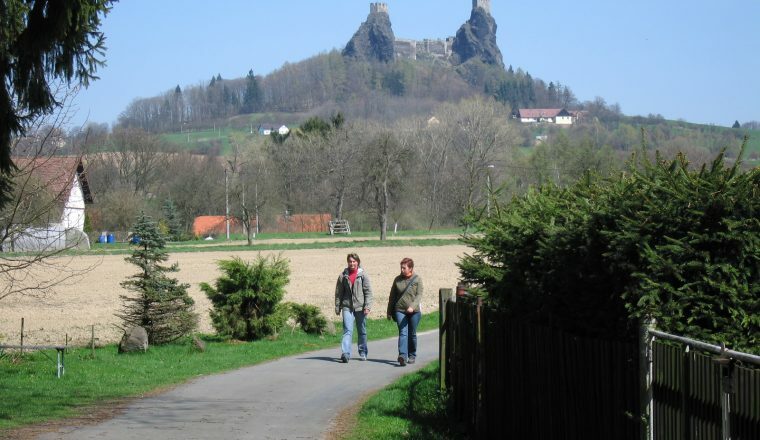 Then the ruin of a 14th century castle at Frýdštejn and at Vranov a castle on a narrow and steep rock ridge built around 1425. Arrive in Malá Skála prettily located on Jizera river. Overnight in hotel*** in Malá Skála. Hrubá Skála – Hruboskalské mesto – Valdštejn 3km – Hlavatice 1km – Turnov 3km – Dolánky 2km – Drábovna 4km – Frýdštejn 4km – Vranov 2km – Malá Skála 1km. Shorter route: Hrubá Skála – Hruboskalské mesto – Valdštejn 3km – Hlavatice 1km – Turnov 3km – Dolánky 2km – Drábovna 4km – Malá Skála 2,5. Day 6: Circular walk Malá Skála – Besedické skály – Malá Skála. From the half-timbered folk architecture at Malá Skála, to the sandstone ridge known as the Czech Dolomites and the 744 m peak at Kozákov, from where there are tremendous views. Return to Malá Skála for overnight. Departure this morning following breakfast. We can book a hotel for you in Prague, available on request. This holiday can also operate in reverse, starting in Malá Skála. Traditional independent 3* Hotels or equivalent. Rooms with en-suite bathrooms. By air to Prague airport. There are numerous flights to Prague from across the UK with budget airlines such as Ryanair, Easyjet. There are frequent shuttle buses from the airport to transport stations. Bus to Jicin takes just over 2 hours. Getting back to Prague from Mala Skala is possible by train, and involves changing at Turnov or a direct bus to Prague. We can organise private transfers from Prague Airport to Jicin – approx. £80 per journey for up to 4 people.